adventures in wine – mostly Australian, sometimes further afield. >Labour Day Monday saw a convoy driving down to the Yarra Valley for a lazy afternoon. Seven adults, two kids and a baby headed east through cloudy skies, past the end of the freeway and into wine country. As Lilydale ended and the vines began, it appeared most of the grapes have already been picked which is just as well given all the storms and rain we’ve had. The surrounding hills had little sign of the devastating fires the area experienced last year: the forests have all but filled out with green now, and the destroyed vines have grown back. The memories will take longer to fade. Past Domaine Chandon, Beaver’s Brook (venue for last year’s legendary Winter Solstice lunch), Rochford (home the previous evening to a Tom Jones concert if he didn’t get rained out) and into Healesville which was buzzing as usual. Innocent Bystander winery is a great casual place for food, wine, aged cheese, artisan bread, excellent coffee, homemade desserts…. you name it. They take the quality and provenance of the food they serve very seriously, which makes it a lovely place to eat. Their two wine labels, Innocent Bystander and Giant Steps, are pretty respectable but my clear favourite is Harry’s Monster, a heady mix of cabernet sauvignon, merlot, petit verdot and cabernet franc. As I hadn’t eaten yet in the day, I essentially had a glass of The Monster for breakfast. Marvellous. We crammed into a huge booth right beside the winery section of the building: a barricade of barrels were behind a glass wall. 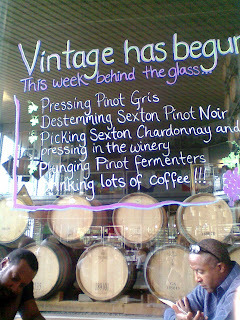 The sign told us that vintage had begun: pinot gris, pinot noir and chardonnay on its way. The spicy pork pizza was served without tomatoes but with an extremely generous serving of garlic. The prosciutto pizza was a little over-garnished with flat-leaf parsley but that’s about all the complaining I could hear. The girls sipped on an ice-cold pinot rose whilst Lenford had a White Rabbit beer from the micro-brewery next door and Ossie had a cold glass of local Punt Road cider. Orlando went all International on us and had a glass of French bubbly. A trip to the loo brought me past their impossible-to-resist cheese larder, where Irish Coolea cheese rubbed shoulders with a Victorian “Holy Goat” and a couple of lovely-looking French sheep’s cheeses amongst others. I am not sure how I managed to get out of there without spending up to $100 on a few hundred grams of cheese…. but somehow I did. Later, back at Lenford’s, our host didn’t quail at an extra ten mouths to feed for supper (yes, we ate a second time that day). He fired up the barbie and enlisted his new army to prepare a feast. Freshly made bruschetta laced with garlic (made by my own fair hand), lumps of pork and beef marinated to perfection, traditional Aussie snags, chicken of course, a bok choi and dry noodle salad, egg fried rice and far too many bottles of wine. We actually drank the man dry. A veritable feast shared with friends in Lenford’s country house surrounded by trees, people hanging out on the balcony, the daybed and the hot tub, good music and great conversation, home cooked food made with love. What a way to end the perfect friends’ weekend. >With our own little slice of Burgundy on the doorstep, it seemed churlish not to get involved in the Mornington Peninsula’s Pinot Week this week. Eileen organised tickets for the Montalto event – an afternoon of tastings at three of Halliday’s five-star-rated pinot wineries, followed by a gala dinner at Montalto itself. The weather held: a beautiful sunny (but brisk) afternoon spent wandering through sprouting vines is no bad way to go. First winery was Scorpo (not Scorpio) winery, where we tried barrel samples from this year’s vintage and got a sneak preview of the 2008 vintage. I even went as far as to try the Chardonnays on offer, which as most of you will know, is a miracle for me. Off on the bus to Prancing Horse Estate, who practise organic and bio-dynamic viticulture. We sat in their beautiful house (about 30 of us) sampling their locally-produced pinot and comparing it to their very own Premier Cru Burgundy whilst Sergio explained the origins and basis of bio-dynamics. A huge platter of gooey cheese perfected the experience. Back at Montalto as the sun – and warmth of the day – started to fade, we stood in the piazza under gas heaters whilst owner John Mitchell and his chief winemaker Robin took us through three 2009 barrel samples from three different blocks, explaining how clone types and aspect differences make for such varying wines despite their close proximity to each other. Sipping a glass of bubbly and downing oysters, sushi and tempura, we watched the light fade over the vines and olive groves before dinner was served. Interesting flavours abounded, including my personal favourite of wild hare ravioli served in a pinot and chocolate sauce. Sounds odd, but it really worked. We sampled six more pinots from 2001 upwards, and put the world to rights with Eileen and Kelvin. A long drive home (thanks Orlando) meant a 2am end to the day, but a great start to spring. >It was all planned. Our monthly Wednesday-night catch-up fell on 18 February and we were good to go. Down to the City Wine Shop was the plan, browse the shelves, enlist the help of the staff to find ourselves a good Piedmontese wine, sit at the bar or outside overlooking Parliament, put the world to rights, and do our selected bottle proud. Then, on 7 February, our world changed utterly. As the bushfires raged all around Melbourne, we got to work and didn’t look back. WBW, in fact everything else in life, took a back seat. We worked fourteen hours a day, fell into bed, did it all again the next morning. Ten days in one of us saw the diary entry reminding us of our original date. We were still swamped in Red Cross operations but decided to make our best effort to meet that night for a few hours of normality amidst the madness. City Wine Shop was too ambitious an objective: too far away even though it is only a couple of miles. We needed somewhere closer to the office. In the end, we grabbed a couple of hours at a local restaurant, Rubicon, on Errol Street. It has recently changed hands and the food was average at best but we didn’t care. Piedmontese wine was not in evidence on the limited wine list. No matter. We chose an old reliable, a bottle of 2006 Buckshot from Heathcote – nothing in common with the Piedmont region but the best we could do. That winery would have faced its own problems on 7 February. Much of Victoria’s wine industry has been seriously affected, with vineyards gone up in flames and a lot of what is left shrivelled in the intense heat. We sat quietly and raised our glasses, to each other, to those much more deeply affected than us, to the future. >I had reason to travel to Healesville and Yarra Glen this week, ten days after the worst bushfires in Australian history hit. We all want to help, so what should we do? Go there. Have a coffee. Go for lunch. Taste some wine. Buy something. Tell your friends. We love our Victorian wines and our country towns. Now is the time to support them. If we all promise to make at least one trip to a bushfire-affected town sometime between now and Anzac Day, spend some time and spend some money, maybe some of the local businesses will survive and life will be better for all of us. Make your plan. It’s not a stay-or-go plan. It’s a Go Plan. you’re working up a sizable hunger for that post-hike picnic you’ve got planned. So what are my thoughts on this wine blogging question? Well, I have lived in Australia for the past three years. Having lived in Ireland and the UK most of my life, the novelty of living slap-bang in the centre of a major wine-growing region has not worn off yet. To my west I have Shadowfax winery not 30km away, my sister’s local wintery and one of my favourites. Further west into the Grampians we have amazing full-bodied reds. East to the Yarra Valley gives us plenty of pinot noir and excellent sparkling wines – Domaine Chandon has a winery there. Up in the King Valley and Rutherglen the reds are wonderful but the tokays and muscats are breathtaking. North-west of home brings me to Heathcote, one of my favourite areas for picking up reds of great quality. Closer to home, about an hour’s drive away are the Macedon Ranges. A beautiful ridge of mountain overlooks the city. Walking trails criss-cross the landscape, or you can head a little further over to Daylesford, the heart of spa country, for a more lazy sort of weekend. Hanging Rock is an extinct volcanic outcrop made famous by the movie “Picnic at Hanging Rock” back in the eighties. It’s a good place for a Sunday afternoon yomp in summer or winter. You’ll see plenty of wallabies hopping around, and the cockatoos are cheeky but entertaining. Nearby, Hanging Rock winery is small and welcoming. John Ellis and his wife run a tight ship, with their grown-up son and daughter also playing key roles in the business. A good day out would be to park at Hanging Rock, climb to the top and take in the views, then stroll down the Lancefield-Woodend Road to the Hanging Rock winery on Jim Road. It’s only about forty-five minutes at a comfortable pace. There, the wines to be tasted abound, but reserve a place for their 2005 Heathcote Shiraz. I have a magnum of the stuff which I could use for my wine hike, which I won at Hanging Rock Winery’s 2008 winter luncheon. It is coming into spring here in Australia, so our picnic would be a more hopeful springtime event. Our wine would be accompanied by plenty of local produce – olives, salamis, fresh local bread, and eaten under a flawless blue sky with plenty of sunscreen to protect against our hole in the ozone layer. We could use the barbecues at Hanging Rock to cook a few Bullboar sausages, a rare recipe handed down from Swiss-Italian immigrants who live nearby. They don’t make them on the Swiss-Italian border anymore, so Australia is the keeping place for this ancient tradition. However, they recommend not to open this huge wine for at least five if not more years… what to do? The Cambrian Rise 2005 Heathcote Shiraz is not a bad second choice. Drinking well now, and about a third of the price of the Heathcote Shiraz, it is worth opening two or more and sharing with friends. And that is what I shall do. What shall I toast the demise of dubbya with? That’s easy. The same wine I toasted the downfall of John Winston Howard with. A wine of commensurable quality for these scumbags: Cat’s Piss Reserve, matured for a couple of days in Footscray rotted fence wood and left to decant for a couple of weeks in a VB tinny! Anyone thirsty? On a serious note I would toast it with a lovely Pinot Noir of Mornington or Tassie persuasion. Nothing takes my mind off politics like a good wine…. I would love to be able to celebrate Obama’s success with a bottle of pinot NOIR from African-American winemakers Esterlina Vineyards in California. Something French and vinegary for the downfall of the 43rd. Something sweet and cosmopolitan for the Obama victory, perhaps a late harvest job. Arsenic for a McPalin victory. I think we have to go for an Australian wine and it has to be Shiraz for the middle eastern link. How about Bush Bike Shiraz from WA? We could rename it ‘Bush, on your Bike’ Shiraz for the day! Craggy Range single vineyard from Gimblett Gravels vineyard in Hawkes Bay NZ. It is called Te Kahu and is from 2005 – what a wine – 78.8% merlot and 21.2% cabernet sauvignon – mmmmmmmm!!!!!!!!!!! Regardless of who wins, to bid farewell to Dubya, perhaps Touch O’ Coffin Chardonnay or Supreme Afterlife Shiraz from Little Morgue Winery on Queensland’s Sunshine Coast. Australia’s quirkiest winery has a sense of humour: this one-time morgue has been transformed into one of the most unique cellar doors in the country, with its original Gothic chapel serving as a wine tasting room and art gallery. You can even dine at the Cadavery Cafe! If we are waiting on a knife-edge for the Supreme Court to give us a result (again), we can say a prayer and sip on a Last Ditch viognier from d’Arenberg in McLaren Vale. And if the worst happens and McCain-Palin get in, it has to be Wirra Wirra’s The Angelus cabernet sauvignon (because God help us) .